Filed to: What on earth did I just watch?Filed to: What on earth did I just watch? 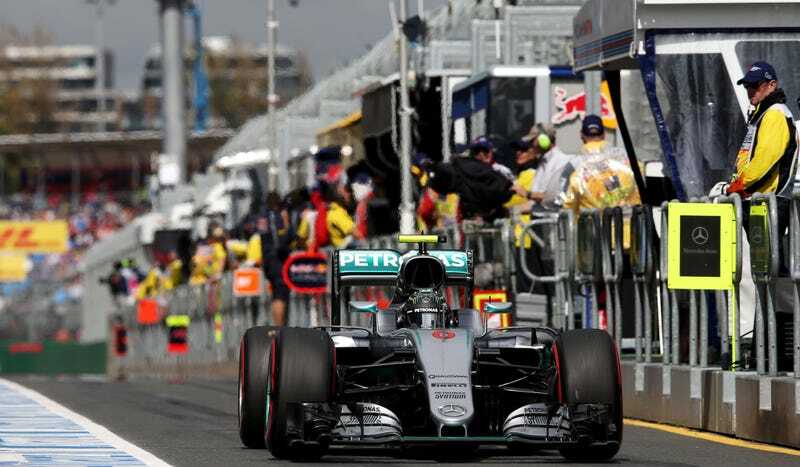 Today’s Australian Grand Prix qualifying started out promisingly enough. There was a little queue at the end of pit lane, with teams waiting on their softest tires to set down a good flying lap at the start. Cars left the pits going balls-out, hoping for that one good lap that could spare them from elimination. Mistakes were also more common at the beginning of the first qualifying session. With only a limited amount of fast run time from the soft tires before cars would be eliminated, mistakes had more potential to ruin a driver’s day. Some cars were waiting at the start of qualifying longer than they perhaps should have. Mercedes’ Lewis Hamilton struggled to set off on his rock-hard cold tires and kept adjusting items in his cockpit on track, as if he didn’t have time to settle in all the way before nosing ahead of teammate Nico Rosberg in line. Hamilton was soon passed early in the first qualifying session by both his teammate as well as Haas team’s driver Romain Grosjean. Haas is a brand new team for 2017 and isn’t quite up to speed yet. Hamilton then lost time when he caught up with Grosjean later, once the Mercedes’ tires were up to temperature. Rosberg, too, took a shortcut through the grass at turn 12 on his cold tires. One of the biggest issues teams had with this new qualifying format was with those super-soft tires. Teams could really only get one good, flying lap out of a set of tires before they weren’t competitive anymore. If you thought this new system would lead to more action on track, well, not really. Instead of waiting until later in a session to make a move, everyone went out straight away to get at least one good lap in the books and then often came in for fresh tires or fuel. If a team refueled, it had to be done inside the garage, and that took quite a bit of time. Problem is, a lap time had to be complete before the driver with the slowest time would be culled from a session, otherwise it could not count. Confusingly, drivers were allowed to finish their final laps for a lap time when the checkered flag came out. Either way, the backmarker Manor team confirmed on Twitter that they were only able to get in one flying lap after traffic started to clear up before they were eliminated. Some teams, simply took too long to finish working in the garages. These teams would then get eliminated in the pits—not while they were out on track. Repeatedly, we saw drivers who were otherwise waiting to go back out on track with fresh tires give up when they noticed the elimination countdown ticking for them. Ninety seconds—the interval at which drivers are eliminated within a session—barely allowed the faster teams enough time to make one lap. That kind of will-they-or-won’t-they “action” inside the garages themselves would be impossible to see from anywhere at the track that doesn’t look right into the garage area. Perhaps this is the world’s most garbage way of getting on-site spectators to spring for a timing app so they can tell who’s in the pits, provided the probably-over-capacity cell service for the track wouldn’t render such a solution unusable. The end result of this qualifying switch was a vastly more complicated system that produced the familiar, predictable results we’ve come to expect from Formula One qualifying in recent years. Mercedes’ Lewis Hamilton scored his fiftieth Formula One pole position, with teammate Nico Rosberg right behind him in second place. The two Ferraris of Sebastian Vettel and Kimi Räikkönen were third and fourth, respectively. The only real surprises were from Toro Rosso and Red Bull. The two cars of Toro Rosso—the Red Bull junior squad who’s running a 2015-spec Ferrari engine this year—will start from fifth (Max Verstappen) and seventh (Carlos Sainz). Meanwhile, Red Bull’s Daniil Kvyat complained that he was unable to get heat into his tires, and was the fifth car in the first session of qualifying to get knocked out. Only the two Haas and two Manor cars were eliminated before Kvyat. Red Bull’s Daniel Ricciardo made it into the third and final qualifying session, but was eliminated right away. Ricciardo will start in eighth position. Otherwise, the backmarkers and new team Haas drug up the rear of the field, the midfielders were mid-pack, and it was business as usual. In short, Formula One has achieved nothing by messing with qualifying—except perhaps making the entire debacle pointless to watch on-site and downright depressing at the end for everyone, everywhere. So much of the “action” for this style of qualifying centered upon the garages that it’s unbelievable. At home, a countdown clock on the on-screen leaderboard at least made it somewhat easy to see who could be eliminated next. Unfortunately, that team was either trying in vain to eke out a lap that wouldn’t be finished before the countdown was over, or more commonly towards the end, already taking off their gear in the garage as soon as they knew they wouldn’t have time to get one last flying lap in. The top four positions on the grid were all but set with over three minutes left in the final qualifying session. Vettel and Räikkönen retired at roughly the same time after their tires were done. The last car came off the track with approximately two minutes left to go. That sucked. It felt like drivers were giving up to watch them walk over to weigh in with time still left in the last session, even if that wasn’t what was going on. It was too easy to predict how it would end for a team to bother wasting the race gas on a Hail Mary attempt at one last quick lap. That, not the qualifying format, is the problem with Formula One. Formula One has become too predictable. For much of qualifying, we were stuck watching timing systems or garages instead of cars turning laps out on track. For part of a race weekend that’s sold to fans as sweet on-track race car action, that is unacceptable.